Want to Know What Your Home is Worth Before Going Any Further? Zillow’s popular Zestimate® tool is a helpful tool to start pricing your home, but to understand your home’s value you really need to use Zillow like the pros do. Most real estate agents use the MLS, but the same methods of finding home values can be used on the real estate sites, albeit with information that lags a bit. The main flaw with the Zestimate® algorithms is that it does not know the condition of the nearby sales and listings. It’s a handy tool but when selling the most expensive thing you own, you probably want to be a little more accurate. 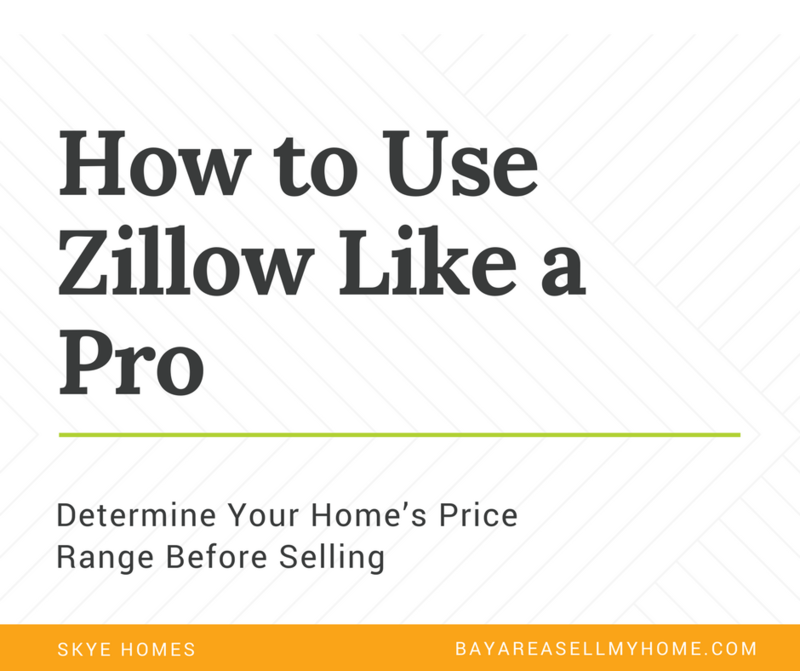 So we’re going to teach you how to be better than Zillow, keeping in mind that determining a home’s projected price range is an art, not a science. If your house is more than 20 years old and you have never replaced the roof, water heater, HVAC, plumbing, or electrical, your buyers may need to do these repairs and they will deduct these costs from their offers. The same goes for cosmetic items such as flooring, paint, kitchen/baths and landscaping. Keep this in mind as we go further along. If your house is in bad shape you may not find accurate comps. It is important to be honest about the condition of your home. your home. Then we can compare homes that are currently listed for sale. For this post I chose the first house listed in our city and re-entered that address on the home page. You can type in your own address or 308 Vineyard Dr, San Jose, CA to follow along. Disclaimer: We are only using public data pulled right from the Zillow listing; there is no private information being shared. The search bar is set to show homes currently listed for sale, but we want to look at recent sales instead. You always want to factor in additional subjective features or issues with a property, and be honest about them. This home is adjacent to a golf course (good) and near the hills (also good), but somewhat far from jobs and buyers might be turned off by a heavy commute (not good). Schools are rated on a scale of 1-10 with 10 being the highest. You can see here that the schools near our example home are pretty good. The condition of this home is average for the area. Take note of my qualifier “for the area.” The finishes in this house may be very nice for where you live, or just average. For San Jose I can tell you that this is an average finish. The owner replaced the counter tops and flooring, the yard is well-kept, there are newer appliances, and crown molding in the living area. On the downside, some rooms could use new paint and the bathrooms are somewhat outdated. Some buyers are fine with the condition of this house, since it is very “liveable,” but the purpose of pointing these things out is to help you start thinking like buyers, not sellers. Going back to our objective criteria above, we want to set Zillow’s filters as closely as possible to those parameters. We’ll first look at the results, then loosen up the parameters slightly to include more homes. 1. Listing Type: Undo check boxes for For Sale and Potential Listings, and check the box for Recently Sold. 2. Price Range: This house isn’t technically listed for sale, but the owner appears willing to sell if someone offers $815,000. We’ll pretend that is the listing price and we’ll change the price range setting to $700,000 minimum and $900,000 maximum. 3. Bedrooms: Since 3 bedrooms is a very common floorplan, there’s no need to include anything smaller. Let’s leave the filter at 3+. One downside of Zillow is that you cannot set a maximum bedroom count. This is a feature that Redfin has. 4. Home Type: Leave it checked for “Houses” if yours is a house. If it’s a condo or townhome, leave both of those types checked. If it’s a manufactured or mobile home, leave only that type checked. 6. For properties with 2 bathrooms I like to set it at 1.5+. 7. For Square Footage, if your property is smaller or larger than the average, start with tight filters. For example, if your house is 1,000 sq ft, set the filter for 900-1,100 sq ft to start with. We can relax these later on. For average sized homes for your area, give it about a 200 sq ft range below and above your home’s size. 8. For Lot Size, similar rules apply as with square footage. If your home is uniquely large or small, set the filters accordingly. Our lot on Vineyard Dr (6,098 sq ft) is average for the area, so I will set the minimum lot size as 4,000. 9. For Year Built I will set the parameters 10 years older and 10 years newer than our property. 10. Days on Zillow: the best comps are the most recent ones, but we’ll use 90 days to get a thorough picture. Ask yourself if anything has happened in the last 90 days in your market to warrant a shorter time frame. If so, use 30 days. That’s okay; just use your mouse to scroll back on the map until you start seeing a few yellow dots. If you do not see any results in your subdivision, loosen up the home settings and the geography bit by bit until you get results. Comps are best if they are within 0.25 miles. Notice there is only one yellow dot nearby our house on Vineyard Dr (the red star). There are many more clustered to the top left of the map, but we want to look at the one closest first. Click on the dot for $755k. Important: pick the best comps. If there are multiple properties near yours, take a quick glance at each of them and weed out the ones that aren’t similar to yours first. Take three of four of the best comps then do the side-by-side-analysis. Both houses are within the subdivision, have decent curb appeal, and are not on a main street. Key information missing from this analysis is the actual street view and neighborhood comparison. You need to take into account if your street is more or less desirable than any you are comparing it to. For simplicity, we’ll say that this comp and our house on Vineyard Dr. have identical neighborhood factors. We’re also leaving out the analysis of price-per square foot. Now we need to analyze and make an opinion on where our house stands compared to this comp. It is reasonable to assume that our house could sell for slightly more than the comp, but $60,000 more (8%) may be a stretch. We need to look at a few more sales and determine which ones are the most similar, then repeat the analysis. After doing that, you should have a good idea of what price range is reasonable for your house. You can also change the “Recently Sold” check box to look at “For Sale” homes but keep in mind that listed prices can be inaccurate as some people are advised to list the price lower or higher than it may sell for. So that’s it! If you need help determining your home’s value, please contact us. If you have already done the legwork and are ready to sell, let us know. We can buy your house in less than two weeks and save you the headache of doing repairs or waiting for buyers to close. Just fill out the form below or call us at (877) 210-6460.